Just recently spent a week alone with God to get my head straight. I felt led by the Holy Spirit to go to a ‘new’ place… somewhere brand new and undiscovered. An unfamiliar area with unfamiliar people, places… ways. In search of solitude with God… I had it all planned out. Even printed my schedule out. Not even close to what would be. I had explored Mt. Washington in the eastern New Hampshire area years before, but never alone. I was excited to be driving up the mountain at dawn to see the sights. An epic drive with serious terrain, this elevation would provide views unlike anything else in New England. Sticking up out of the modest White mountain chain, Washington was a Rockies like 6,288 ft in height. It’s elevation so extreme from the valley below it included over a thousand feet of tundra and high altitude small growth – short season flowers and evergreens. Mt. Washington Selfie – Pastor B. That was the goal anyway. To see further. To gain perspective and clarity. My trip was meant to give some clarity on the future, on the path and plan God would have me follow. These mountain experiences were sort of metaphor for the actual life events around me and on me. As I drove higher the vistas grew hazy and the clouds and fog thicker, my view was being obscured by the weather. What only a moment before had been sky blue for dozens of miles was now hidden, and my winding road showed more and more fog and cloud ahead. My hope for a clear summit on the top was fading. It’s clear in retrospect that God was speaking to me loud and clear on this road trip, BUT… in the moment, I just felt frustrated, alone, and isolated. I had made all this effort to put myself in just the right place and time to hear and see God. But he it seemed had other plans. My expectation was for clear skies, a warm glow of spiritual presence… followed by a sudden and keen transfer of divine inspiration, and a spark of new confidence for the next season of life. His plan was different. He was going take me a different path, and He chose to slow me down and shift my perspective from the future to the past, to somewhere more personal. What did I find at the top of Mt. Washington & Why does it matter….? Driving in the desert is unlike any other place. Long – vast – uninterrupted horizon – skies that stretch beyond the edges of the earth. Barren and beautiful, it opens up in front of you with subtle detail. Sage and cactus, old washes with sandstone sides, brutal pitches of solid rock and flat-topped mesa’s the size of a small city. It looks and feels like the end of the world, the furthest reach of life. All of it clinging like a thread to survive. Cold and Hot, dry and dusty, it howls with the windswept cry of its isolation and fatigue. Quite a metaphor for life. How often do we find ourselves driving through a ‘desert’ of existence? How far do we travel on the two lane ribbon of asphalt, wondering if we’re going to make it? God is in the desert places of our lives. It is in these vast unbroken stretches of existence that He longs to have us come near. To shut off the noise of our existence and simply ‘be’ with Him. I found myself in such a place and in such a state. Driving for hundreds of miles… Solo and Silent. Waiting for a word from God. A whisper of divine affirmation, a word of encouragement or even correction. Anything to block the nearly silent sadness of my heart. In these moments I let go. Somewhere between Grand Canyon and Phoenix I decided to stop figuring it all out. To stop calculating and striving, to rest and release my worry and my pain. Somewhere in the desert God touched my heart and made it new again. Truth began to bubble up in me. Words of insight and understanding. Helpful and encouraging it captured my struggle and restored my hope. Perspective gained in a lonely vigil. I believe it was in the “waiting and delay” of my journey that I was able to hear and respond to God. I believe it was in the silence and isolation that I was able to face the issues and patterns of my old self that needed to be slayed. It is in these moments of alone that we grow. Dear ones… trust where God leads . He knows what we need. We awoke to another frigid dawn. (33F with frost on our car windows and reports of snow in the mountain passes) Less surprised than the day before…we armed ourselves with fresh purchases of warm hoodies and winter hats. We hit the road west, and ate a quick breakfast on the go… noticing the skyline clearing as the elevation rose steadily on our drive up to Grand Teton National Park. Everyone knew what was coming next… we had discussed our group plans for a serious hike for almost a week. Reviewing the safety precautions (bear spray, making noise as we hiked to avoid startling a grizzly etc…) and talking about the epic views, what it would be like to go into the unknown. Everyone was a bit nervous to get started. We loaded up our backpacks at the Jenny Lake visitors center, water bottles and an exotic assortment of cliff bars as we talked about all the ‘what if’s’ of hiking in real wilderness. I noticed Tanner was unusually quiet as we all got our gear together. She seemed to be shrinking into her flannel shirt as the moment grew near. I could tell she was afraid, the frustration from our day at Yellowstone still cloudy in her eyes. She pushed her lips tight and grunted a shy reply… she didn’t want to go. Intimidated she couldn’t make it up the steep trail and as our designated fashionista she wasn’t really ‘into’ wilderness stuff. I gently encouraged her that we were ‘all’ going together and promised we wouldn’t leave her behind if she got winded on the climb. Reluctantly… she got up and started moving slowly to Jenny Lake. The others excitedly babbling about seeing a bear or a moose, and Tanner just tucked her head a little deeper into her collar, head down… wishing she could be anywhere but here, with us. We headed across the crystal clear mountain lake, using the shuttle boat (I highly recommend) to reach the trail head to the very popular Inspiration Point (tourist hordes) and the Cascade Canyon Trail, (much higher, longer and less traveled) which was our destination. We had a good 5-6 hours of hiking ahead and according to the rangers at the trail-head, bear and moose were active on the trail. I felt Tanner withdrawing even deeper… so far from her comfort zone. I sympathized… remembering how I felt in New York City. An hour later we were reaching the crest of the first major climb, a brutal 55 minute ascent. Tanner was head down (between her knees) with puffy eyes and tears. Wheezing, and ranting her anger at being forced to go on this hike from hell. I tried to encourage her, explaining the worst of the hike was over… and how proud I was of her sticking it out. She huffed at me. So I moved on, silently asking God to ‘show up’ for Tanner. 30 minutes later she flew by me almost skipping… laughter and Broadway strains of Les Miserables flowing off her lips. No tears, no sadness… just exuberant joy! What the heck… ? I stared in amazement as Tanner was leading everyone else up this canyon trail. Full of happiness and energy, pushing us all to keep up! She and Addy climbing rocks, investigating the sights and sounds of a pristine alpine ecosystem with the unrestrained enthusiasm of a ten-year old! Whoa…. Some prayers get answered right away… I guess ? Wow. I couldn’t have been happier for her if it was my own daughter. I cried a little as she ran and ran… and ran! Like some kind of dam had burst inside of her, freeing something vital and life-giving. Something precious and pure. The mountains do that…. the beauty of creation invades our minds and breaks through our broken hearts. Restoring and renewing even our darkest places and spaces. God was in these mountains… whispering. Calling, answering… touching. Alexis saw her elusive moose… drinking quietly from the cascade creek, sandwiched between the Grand Teton peaks as if we were in some kind of surreal postcard come to life. God’s gentle reminder… He wants to satisfy our deepest desires and most intimate longings. The moose a long-term bucket list item for Alexis… and here in this remote corner of creation, God was speaking. Affirming His presence. 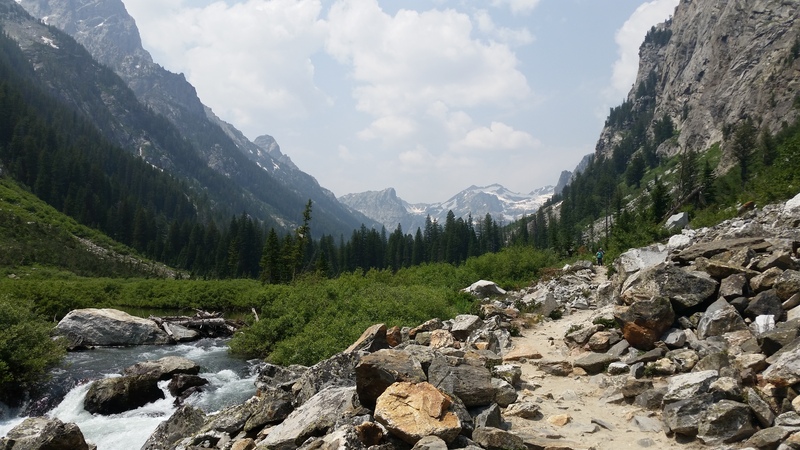 The trail to Cascade Canyon is one of my most favorite places in the world…. it was and always is a life-changing experience for all who make the journey. PS – and “Flannel Up” is now a code word for those of us who made the iShine Road Trip of a lifetime together... coined by our very own Tanner 🙂 It’s a symbol of how we can choose to trust God – when we get put in awkward or uncomfortable positions and choose to stay in them, believing He will in time make something awful – become incredibly beautiful! Thanks Tanner for being such a courageous and amazing young woman! We drove hard to get across South Dakota. Summer skies above and green hills rippling with grass waves of wind, stretching out as far as the eye could strain to see. For the six of us… our hunger to explore and discover grew steadily by the hour. We crashed at Wall SD, and quickly found the entire town was built as a throwback western nick-nack haven bulging with tourists off a two block main street drag. Neon cowboy signs dominated by the mother of all trinket stores called “Wall Drug”. Inside, everything from curiosities and leather goods to candy, antiques, Elvis blankets, and native american pottery from China, yikes! The food was worse than my college cafeteria, the trinkets for sale were Velveeta cheesy… but after twelve hours of straight driving, we were thrilled to be out and about. The gang hit the hotel pool as evening temps hovered in the low 90’s, it was only another 70 miles to Mt. Rushmore and they were ‘stoked”! Morning dawned crimson and we hit the highway bright and early, phones charged and every eye looking across the Dakota plains… focused further west, ready for adventure! These guys had all heard about Mt. Rushmore, seen it on TV and lots of movies, but this would be our first National Park to visit and we were ready. For those traveling westward, it’s worth the effort to re-direct your route to see the sight. An American symbol of leadership and a tangible testament to ingenuity. They loved it… and so did I. Pictures, video… selfies and gift shops filled almost two hours in a flash. Trinkets, keep-sakes and treasures stowed away, we climbed back in our SUV and set our GPS to Grand Teton National Park. With some luck and decent weather, we would be checking into our Dubois WY hotel at sunset. Time to keep moving, time to dig deeper into the adventure of our American west. The kids were starting to sense the enormous size and distances of our vast county, we drove until the cities stopped and sky grew to fill the view. We were no longer in familiar lands, the world was changing and we were enjoying the ride. So we sang, and laughed our way across high mountain plains, snow capped peaks and rolling valleys… always looking for more, no one wanting to miss a thing. Edge of the seat road-trippin, and all of us were becoming more aware…this would be an epic pilgrimage, a coming of age moment we would always share. RoadTrip passion runs deep in my heart of hearts. I long for the sight of it, a glimpse of the far far away, the glory of hidden creation… ancient beauty. I catch a hint of it in the rugged strength of a towering sequoia, in the roar of a spring time stream straining to break out of its channel, foaming -ripping its way to somewhere ‘below. I sense the artist heart of God in the crisp bite of pre-dawn at high altitude, the clarity of a mountain vista surround by pink hues of sunrise, a valley hidden by the sea of clouds below. The sacred romance of beauty and wonder tug deeply in my heart. Whispering. THESE are the things of LIFE. The glory of God’s creation… filtered by thousands of years and a millennium of mankind’s industrial advance, it still echoes of perfection! Exposing our kids to this much pure beauty changes everything! RoadTrips do so much more than simply connect us to each other, they connect our heart to the possibilities of a life with our creator. 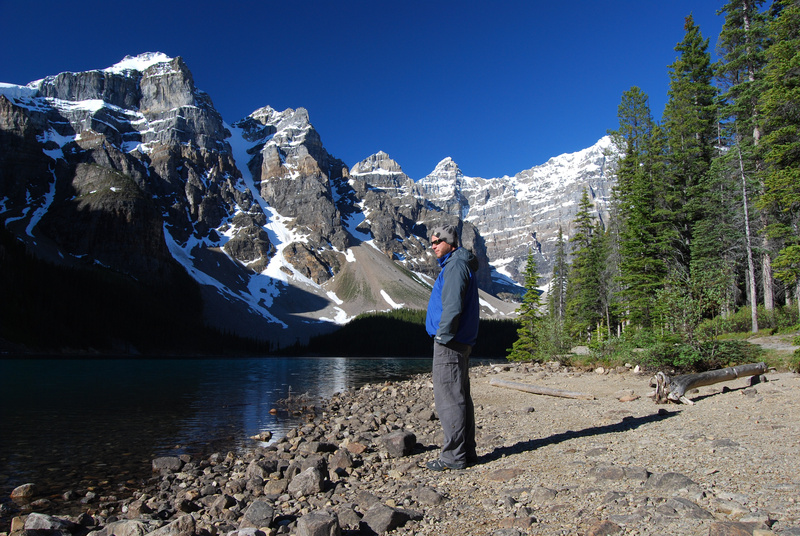 Next week I’m taking my 18-year-old on a hiking – driving – roadtrip to the Canadian Rockies, Glacier, Yellowstone and Grand Teton NP…(for his second time) of what I’m sure will be ‘many’ adventures he will have in the wilderness world. By God’s grace I can see my faith and passion for living being passed to the next generation, one roadtrip at a time. PS – for more info on my roadtrips and the mountain west, check out my book, Road Trip to Redemption. Leaving Hwy 49 at Jackson CA and turning East, I felt like fresh air had just been injected into my weary suburban heart. The Sierra surprise detour had been wonderful, and now onto my destination… crossing the Sierra Mountains via California State Hwy 88, the road started to climb… elevation 1217 feet above sea level. 20 miles later I was still climbing, I watched as every five minutes I passed another elevation change sign. Five thousand, Six….Seven….Eight…snow was visible now in the wooded terrain, piled up under shaded overhangs and deepest wood. The road was winding and snaking through the changing environment, two to four lanes of smooth blacktop with a magnificent tour of the evolving alpine world of the Sierra’s. Snow could be seen now capping the nearby peaks with glinting ice fields and thousands of frosted evergreen acres stretching out as far as my eye could see. I pulled off the shoulder of the road and snapped a few pictures. The scent of pine and cedar was seductive… what if I just grabbed my pack and started walking? Left the crazy – over stressed – psychobabble of the modern world behind and just went to be with God, nature and the silent solitude of the Sierra’s…. it was very tempting. But alas… the cold was starting to creep into my un-gloved hands and my Patagonia mocs weren’t cut out for much rock hiking, I wouldn’t make it two hours before I would be frozen and frustrated. Better stick with the plan. Keep moving, forward. Responsibilities, obligations…. everyday life was calling me back from my reverie. I climbed back into my rental SUV and kept driving East. Hwy 88 was a beauty. A main artery to Lake Tahoe for the locals, it was in excellent condition, obviously one of the key routes for travel during the winter (when the other two-lane, lesser used highways closed for the season) and not a snip of ice or snow was present to slip or slide on. Crossing the Sierra’s was not an up and done, but a long – 60 minute drive with a spectacular, top of the world – feeling as I passed alpine lakes and cliff top summits, sprinkled with snow and sun. BEAUTIFUL ! The California Sierra’s are worth the effort. Driving my thousand mile loop WAS crazy, but it was crazy with a promise and man did that promise DELIVER ! Winding over the pass during mid-day and into early afternoon, I could see the golden glow warming the tips of the peaks as early winter sundown approached the sheer flanks of the mountains. I quit gawking and started driving, needing to get south of Mammoth to make my flight out the next morning. I pushed south on Hwy 395 briefly crossing into Nevada and back as the road again surprised me with stunning beauty and wonderful fifty mile panoramic views. Topaz Lake, Mono Basin and then Mammoth. Mammoth mountain has always been legendary among outdoor enthusiasts, but to see it personally in the winter was breath-taking ! Juxtaposed between the eastern Sierra mountains and the Death Valley basin desert… it’s divine. My journey south on Hwy 395 caught the last vestiges of a warm pink glow on the horizon; a gentle, winter, sunset. The best for last…. for sure. Thanks GOD, I needed that! If you’ve not seen a desert sunrise or sunset, you need to. Put it on the bucket list. As I climbed into my price-lined $80 hotel bed in Lone Pine, CA.., I was so grateful for the last 24 hours God had gifted me. My own private tour of the Sierra mountains. Each detail carefully prepared ahead of time, and all I had to do was just follow the clues…. (my heart’s longing led me to pull away) and the rest was taken care of. How often did Jesus do exactly the same thing? Dozens of times that we know of in scripture. He frequently went alone to a mountain to pray…I believe to clear his head and listen, to be refreshed from the rigors of public ministry. Take the risk… go on your own Sierra tour (or one closer to you) and unplug-reconnect and renew your heart. You won’t regret it…the mountains are calling, “Come Away”.